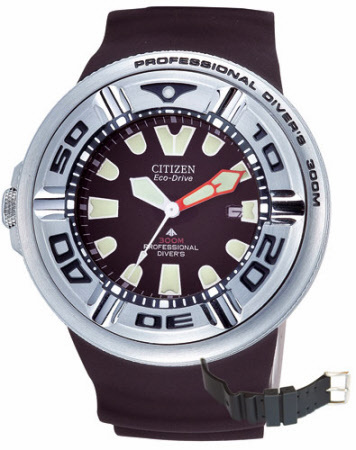 Professional diver watch from Citizen. Water resistant to 300 meters. The EcoDrive technology converts sunlight or artificial light into pure energy. No more batteries! Stainless steel casing (matte) with helium overpressure valve, single-rotating diver bezel with luminous reference point (scale 0-60 min), Protected edges, extra thick (6 mm) mineral glass (), schockgeschützte and screw-down crown (9 kratzgeschützt h), stainless steel screwed with special embossing (individually numbered), protected flanks, replaceable screwed Special rubber strap (removable) with stainless steel strap and stainless steel buckle, anti-allergic materials to experience, and anti-magnetic. Citizen Promaster for 300 meters water depth. Super-stable and extremely durable with a sensational production technology. Price includes original box, manual, with detailed product information, original warranty of the manufacturer.